Feb 16 : Wine Tourism has been in a state of infancy in India but Sula has taken the lead and pioneered the concept with its former guest house and now a resort BEYOND as an independent profit center that also helps promote its brand, with York following in baby steps but the new baby Fratelli already pro-active and Four Seasons trailing because of location disadvantage, writes Subhash Arora who believes that the idea of wine trail should be encouraged by bodies like IGPB. Much was written about the Tasting Room when Sula opened it about 6 years ago and ushered in wine tourism. To be fair, Indage had initiated it with the first wine bar Athena outside the winery in Narayangaon but it did not measure up to the image of a true tasting room that would attract wine lovers. This was followed by Rajeev Samant making an amphitheater next to the winery to organise events in a small way that would encourage people from Mumbai etc to visit the winery. He kept on expanding the infrastructure around the winery and within the vineyards, experiments with restaurants and different cuisines and even bringing in the annual Sulafest in order to go beyond just making and selling wine. Realising the shortage of hotel space and in order to lure the city people for a sojourn in the vineyards, a common sight in Europe, US, Australia and other wine producing countries, Sula decided to rent out overnight stay packages starting with tents initially but with constant expansion it came up with BEYOND@Sula, a 23 room resort (4 more rooms are soon to be added) with full boarding and lodging facilities (now named BEYOND resort). He leased the property and the vineyards around it on a long term contract basis like the grapes, making the expansion possible on a fast track. ‘It is a good business model for any winery and helps reduce the downside risk of downturn in the wine selling business,’ says Rajeev Samant, founder CEO of Sula, who has not only taken the lead in introducing wine tourism in India but also developed a profit center at the Tasting Room and ‘Beyond’ with separate teams involved in the direct management. York Winery- The other wineries are now waking up to the potential of wine tourism. As the cliché goes, If Sula is there, can York be far behind? The much smaller and younger competitor of Sula basks in the glory of its neighbor and a well-established producer. Due to close proximity it also has advantages of the foot-falls since visit to 2-3 wineries is always more enjoyable than just one and gives a better ROI of time and money. The Tasting Room modeled after Sula but with almost a better panoramic view, has been quite successful. ‘About 10% of our domestic sales are derived from the tasting room which has a full-fledged kitchen to serve lunch and snacks,’ says Ravi Gurnani who offers tasting flights and already has an eye for a small resort based perhaps on the style of Beyond. He already duplicated a mini version of Sulafest last year and York Live is here to stay. Zampa is well located to be a wine tourism destination. It is practically on the main Mumbai Agra Road- at lesser distance than Sula from the main highway. Yet it has not given a serious thought to what could turn out to be a cash cow-certainly a profit center. It would well qualify being part of a ‘Nasik Wine Street’. Neeraj Deorah, the Director of Zampa confirms that they have had plans to build a guest house on the plateau on top of their vineyard. The 360° view from this spot is gorgeous. But the management does not appear to be willing to take the plunge yet-perhaps due to financial constraints, restructuring possibilities or simply keeping the business alive after the bout of recession. They do offer winery and vineyard visits to groups or even walk-in customers at a nominal price of Rs. 125 for tasting pour of 5 wines. For an additional Rs.75 one can taste both their bubblies too. 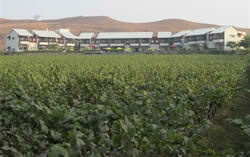 The vineyards are slopy and beautiful and a visit to the vineyard is highly recommended on the way in or out of Nashik. Other wineries in the area have not yet developed the tasting rooms for tourists or lodging facilities though Chateau d’Ori had once an excellent vision of a sojourn-that was shattered because of the financial crisis that seems to have bogged the company down. Vintage Wines have a Tasting Room planned but not in sight in the near horizon though they welcome visitors that take the trouble of coming. Nine Hills has modern facilities but too dogmatic and corporate styled operation that has perhaps some plans but carefully wrapped for the time being, awaiting instruction from the headquarters in Paris. Located in small village about 170 km from Pune, the latest winery to join the wine-producing wineries, is only 3 hours by car from Pune but a long 6 hour-drive from Mumbai. It has the latest state-of-the winery and vineyards that could teach you the secrets of making good quality wines across the board. They have even built a guest house to look after their Italian guests but in the process offer interesting facilities like a pool table, rides on the ATRs they own. Currently, 3-4 rooms are available at Rs.7000 a day. One-day tasting package costing Rs.1500 includes a traditional welcome-a la Maharashtra that sets you in a royal mood. Lunch is included as is a 30 minute ride on the ATV in the Motiwadi vineyards sprawled as far as your eyes go around the winery. 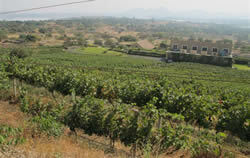 So is a tour through the winery, cellar and their Motiwadi vineyard and Gharwar, about 8 kms away. Even the tasting with various condiments comes with 6-9 wines, offering the visitors a very relaxed day tour. A night stay is recommended to enjoy the morning walks and the beautiful sunrise and all the natural beauty the place has to offer. If you are with a group of friends, the second day lunch under a hut constructed on a plateau, called Syrah Hill, can be really rejuvenating, the two complimentary bottles of Fratelli Classics and a tasting of their special wine ‘Sette’ acting like condiments. For details, contact Abhishek Naik at anaik@fratelliwines.in or simply write to info@fratelliwines.in. A couple of hours away from Pune or Akluj is Baramati where the UB Subsidiary produces Four Seasons and Zinzi wines. Slightly out of the way, the company has been promising a guest house that will be available on hire with facilities like swimming pool. But for reasons not clear, the date of throwing it open to public keeps on getting postponed. However, once it comes up it will be a welcome addition to the Wine Route from Pune that will cover Fratelli and Four Seasons to begin with. It will be a matter of time when other wineries come up in future. Wine routes are hot favourites and a given in any winemaking country in the world, be it Italy, Germany, US, Australia or South Africa. Designed for different regions, Maharashtra needs to take a lead by defining these wine trails that help the visitors to plan their wine trips without necessarily any outside help. There are a few possibilities based on the existing wineries. Sula, Zampa and York being the natural choice with the possibility of Vallonne and Indus (both close to Zampa) joining in the programme. Many regions have the wine route designed by the local governments which would mean that all wineries in the area would become a part of the map detailing wine streets/routes. However, there are cases where the local wine associations may join hands and have the participating members join these ‘ wine streets’ or ‘ wine routes’ or ‘wine trails’, in which cases certain nominal charges would be justified to make it a self sustaining project. Other possibilities are in Dindori area- Nine Hills, Chateau d’ori, N D wines, Sula Vineyards in Dindori may be combined with Mercury, Renaissance in Ojhar on Mumbai-Agra road and possibly connected to Vintage Wines in Niphad continuing on to Vinsura, Flamingo and Vin and Vouloir. There are several possibilities including a ‘wine street’ from Pune to Nashik, 210 kms away, going through Narayangaon where one can pass through Indage as well, if only for nostalgic reasons till its revival becomes a reality. The first wine bar-Athena, outside the winery is hopefully still pouring tasting shots of their wines for those interested wine lovers. Indian Grape Processing Board needs to look at the possibility of taking up this assignment of defining the ‘wine trails’ as a step to increase the flow of traffic for wine tourism. They ought to work with the Ministry of Tourism as there will be an ever-increasing number of foreign tourists also, keen to visit the Indian wineries. Once the wine route is in place, this is bound to increase the traffic to the wineries that will gladly upgrade their Tasting rooms and make the visits more interesting. 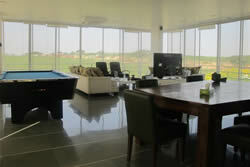 Infrastructure for stay at the vineyards will follow because of entrepreneurial capabilities of Indian businessmen. There are several plans and wish lists in the offing and a few entrepreneurs are already working towards improving the wine tourism. Mercifully, the connectivity between Mumbai and Nashik has improved tremendously and the 2.5-hour city to city drive is a reality, thanks to the newly built highway. The All India Wine Producers Association has a plan to run a toy train through the wine village in Nashik-which is presently a distant dream and designed more to grab news bytes for the moment. Beyond making and selling wine there is an allied industry waiting and striving to catch up with BEYOND!